Nanoparticles (gray) attached to a red blood cell are able to escape detection by the body’s liver and spleen, paving the way for more effective, less toxic drug delivery. Every year, more than 18 million people around the world are told, “You have cancer.” In the U.S., nearly half of all men and more than one-third of women will develop some kind of cancer during their lifetimes, and 600,000-plus die from it annually. Despite the billions of dollars and countless new treatments that have been thrown at it since President Richard M. Nixon declared “war” on the disease in 1971, cancer refuses to be beaten. Why does it remain such a formidable foe? After all, it’s been known since Nixon’s day that unrepaired genetic damage can cause cells to grow uncontrollably, which is viewed as cancer’s root cause. But this understanding has not pointed the way to an obvious treatment. Research into cancer biology has revealed it to be one of the most complex and insidious human diseases for a variety of reasons. First, cancer can be caused by any number of factors, from viral infections to exposure to carcinogenic chemicals to simple bad genetic luck. One patient’s lung cancer might be caused by an entirely different constellation of mutations than another’s, and a drug that targets a certain mutational profile benefits only a subset of patients. Furthermore, cancer cells often spontaneously develop new mutations, limiting the effectiveness of genetically targeted drugs. Second, cancer is caused by malfunction of the body’s own cells, so it is hard to design drugs that will target only cancerous cells while sparing healthy ones. Third, while genetic mutations can drive cancer formation, cancers can stop growing and remain dormant for years, suggesting that there are more factors at play than gene mutation alone. And finally, cancer has a number of different “tricks” that allow it to hide from the body’s highly vigilant immune system, letting it grow undetected and unchecked until, often, it is too late. Cancer treatment regimens through the 19th and 20th centuries were largely limited to an aggressive triumvirate of surgery, radiation, and chemotherapy, all of which carry traumatic side effects and can bring patients to the brink of death in the name of saving their lives. As our knowledge of the disease has grown more nuanced over the decades, a paradigm shift has happened in the field, centered on the recognition that attacking a complex disease with blunt tools is not the most effective approach. A surge of new therapeutic strategies — including immunotherapy, nanotechnology, and personalized medicine — is giving hope to patients for whom traditional treatments have failed and offering the potential of long-lasting cures. Scientists at the Wyss Institute for Biologically Inspired Engineering with expertise in fields ranging from molecular cell biology and immunology to materials science, chemical engineering, mechanobiology, and DNA origami are at the forefront of several of these novel approaches. Their research, united by the common principle of emulating nature, has the potential to make existing treatments better, create new ones, and even prevent cancer from starting in the first place. Chemotherapy has been the backbone of cancer treatment for the past half-century, because it infuses drugs into the bloodstream to kill rapidly dividing cancer cells all through the body. However, since chemotherapy systemically targets all fast-growing cells, it can also damage the intestines, bone marrow, skin, hair, and other parts of the body, and in some cases must be given at such a high dose that it nearly kills the patient in the course of treatment. Efforts to make chemotherapy drugs less toxic have included encapsulating them in nanoparticles that release them only when they reach their intended location, but less than 1 percent of nanoparticle-encapsulated drugs actually reach their targets, as the human liver and spleen aggressively filter them out of the blood. Samir Mitragotri, a core faculty member at the Wyss Institute, decided to apply chemical engineering to the problem of keeping drugs in the bloodstream long enough to do their jobs. The first thing he faced was that red and white blood cells circulate through the blood several times a day, seemingly escaping detection and destruction by the liver and spleen. “I thought, ‘If these cells are naturally not cleared from the bloodstream, maybe we can use them to help the nanoparticles stay there as well, rather than creating some new and expensive disguise to protect the nanoparticles,’” said Mitragotri, the Hiller Professor of Bioengineering and Hansjörg Wyss Professor of Biologically Inspired Engineering at the Harvard John A. Paulson School of Engineering and Applied Sciences (SEAS). Mitragotri’s lab found that nanoparticles attached to red blood cells are indeed ignored by the liver and spleen in mice, and the nanoparticles are sheared off and deposited into tissues when the blood cells make the particularly tight squeeze through the tiny capillaries that deliver blood to organs. By injecting blood-cell-bound nanoparticles into a blood vessel directly upstream of whole human lungs, the researchers were able to get 41 percent of them to accumulate in the lung tissue — a far cry above the usual 1 percent. “Simply by changing which blood vessel we inject the nanoparticles into, we can deliver a much higher dose of a drug to its intended organ, and rely on the body’s natural clearing mechanism to get rid of any particles that don’t reach the target. We can even get some nanoparticles to target the brain,” Mitragotri said. Despite its bad reputation, chemotherapy is unlikely to be going anywhere soon, as research has found that new therapies work best when given in combination with chemotherapy. But technologies such as blood-cell-bound nanoparticles could help reduce the dose that must be administered and increase chemotherapy’s efficacy, improving the quality of life for cancer patients worldwide. The Wyss Institute’s cancer vaccine mimics the body’s lymph nodes by presenting antigens from a patient’s tumor to dendritic cells, which can then initiate an immune response against cancer. Mitragotri has also found success applying this nanoparticle “backpack” strategy to white blood cells called monocytes, which differentiate into immune cells called macrophages that fight diseases including cancer. Not only are monocytes able to carry their nanoparticle drug loads with them as they infiltrate tissues (which could help deliver drugs to tumors deep inside organs), but the nanoparticles could one day be used to control the monocytes themselves. By exploring how controlling immune cells might help kill cancer, Mitragotri is dipping his toes into the burgeoning immuno-oncology movement, which reasons that modifying a patient’s immune system (which is already designed to hunt down and kill malfunctioning cells) so it can overcome cancer’s evasive tactics is better than trying to design a novel drug for every kind of known cancer. The FDA has approved a number of immunotherapy approaches in recent years, including “checkpoint inhibitor” drugs that take the brakes off immune cells that have been inactivated by cancer cells, and T-cell therapies, which involve removing a patient’s T cells, engineering them to attack the cancer, multiplying them, and infusing them back into the body. A newer tactic, cancer vaccines, attempts to modify a patient’s immune system from within so that it not only attacks existing tumors, but also creates an immune “memory” to destroy future cancerous growths. However, engineering that process to take place completely within the body has proven to be a challenge. The only cancer vaccine the FDA has approved so far was Provenge, in 2010. It was a commercial failure due to its hefty $93,000 price tag and complicated, days-long treatment process that required multiple infusions. The body has a natural training ground in the form of its lymph nodes, which harbor immune cells called dendritic cells that become activated and initiate an immune response when they detect evidence of an invading pathogen from the lymph vessels. Cancer cells, however, secrete immunosuppressive signals that can disrupt this process. A materials scientist and chemical engineer by training, Mooney realized that if he could construct and implant an artificial lymph node made from a material that was distinct from the rest of the body (and therefore protected from cancer’s influence), it might provide a safe haven in which to activate dendritic cells, which would then unleash the immune system’s attack on the cancer. His lab has done just that, creating a cancer vaccine in the form of a spongy disk about the size of an aspirin tablet that is implanted into a patient and biodegrades once it has done its work. Essentially an artificial lymph node, the vaccine contains signals that attract dendritic cells and activate them with proteins found on the patient’s tumor cells. The activated dendritic cells then travel to the closest lymph node, where they train other types of immune cells to recognize and destroy the tumor. This may provide the additional benefit of protecting against recurrences of the cancer — even in another location — since the trained T-cells can proliferate and circulate through the body looking for the same kind of tumor cells to attack and destroy. The vaccine is about the size of an aspirin tablet, and is placed inside a patient’s body using a simple incision. It also biodegrades safely, and multiple vaccines can be implanted in the same patient. Dramatic responses in cancerous mice that received the vaccine spurred Mooney and his collaborators at the Dana-Farber Cancer Institute (DFCI) to start a phase 1 clinical trial with support from both institutes, to see if it had the same effect in human patients. This kind of study is usually undertaken by hospitals and pharmaceutical companies, but rarely inside academia. In traditional pharmaceutical and biotech environments the process of getting such an innovation into clinical trials usually takes six or seven years, in this case the vaccine was tested in its first patient just three years after initial publication of its development. The results attracted the attention of the drug giant Novartis, which licensed the technology from the Wyss Institute in 2018 and took the reins for future clinical trials, with plans to develop the concept into a treatment for multiple kinds of cancer. One such patient, profiled in a recent Boston Globe article, remains cancer-free nearly two years after being vaccinated for advanced melanoma. But Mooney is not content to rest on his laurels. “Cancer is a complex disease, and it’s unlikely there will be a single answer for all people and all kinds of cancer, so we need to keep exploring different approaches,” he said. One of these approaches is a partnership with another Wyss faculty member, William Shih, who has long been interested in how his research on DNA molecules that self-assemble into defined 3-D structures — also known as DNA origami — can improve the precision with which cancer therapy is delivered. Shih and Mooney are working on a joint project to see if DNA origami–based nanostructures can be incorporated into the cancer vaccine to enhance its ability to create a sustained immune response. Shih’s DNA origami nanostructures take advantage of the fact that DNA is a very stable and predictable compound thanks to the strong bonds between its four chemical bases. By constructing strands of DNA whose sequences of bases along their length are precisely known, Shih and his lab have been able to design 3-D DNA structures that effectively build themselves like automated Lego blocks, and whose properties can be tuned down to the nanoscale. Immunology is all the rage for treating cancers after they occur, but every cancer arises from what was once a normal cell. What if we could tease out exactly what promotes the development of cancer and find a way to reduce the chances it will form in the first place? That’s a tall order, as hundreds of substances are known to cause cancer, hundreds more are suspected but unproven carcinogens, and other factors such as lifestyle and genetics all conspire to damage our DNA. But some causes play an outsized role in cancer’s development, such as chronic inflammation, which is associated with nearly 25 percent of all human cancers. 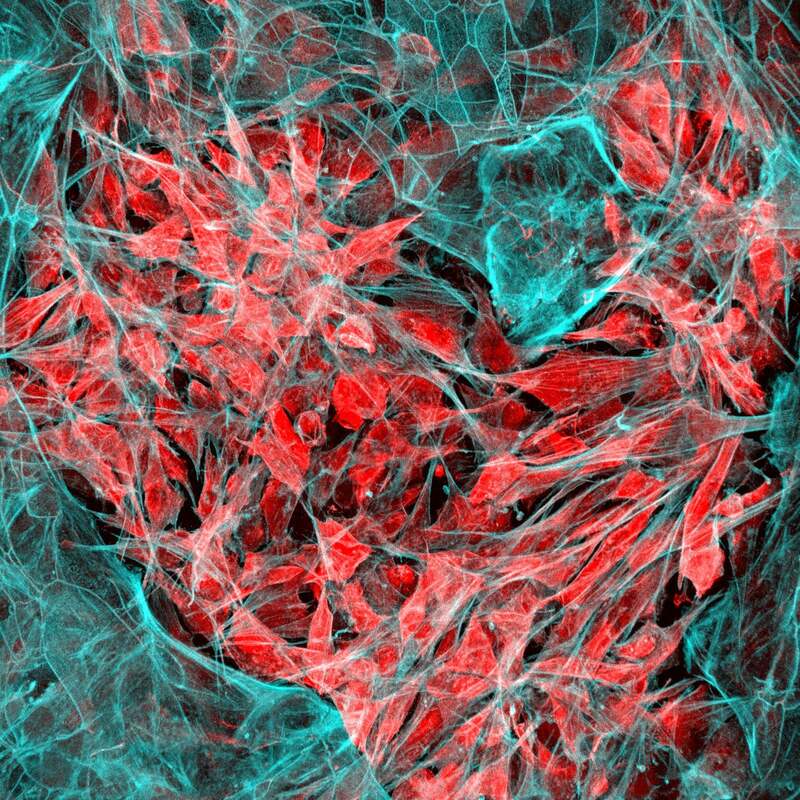 Research being undertaken by the Wyss Institute’s founding director, Donald Ingber is now investigating the possibility of treating the inflammation of the connective tissue and blood vessels that surround and support organs (known collectively as the stroma) rather than directly attacking tumors themselves. Ingber is part of a global research team tackling this problem from multiple angles as part of Cancer Research UK’s Grand Challenge, a competition it won earlier this year. Key to the project is Ingber’s organ chip technology, which allows researchers to carry out human organ–level experimentation in vitro. Each organ chip is a microfluidic culture device containing hollow microchannels that can be lined with living human epithelial and stromal cells, which experience physical conditions similar to those found in the body, including blood flow, breathing motions in the lung, peristalsis in the intestine, and so forth. 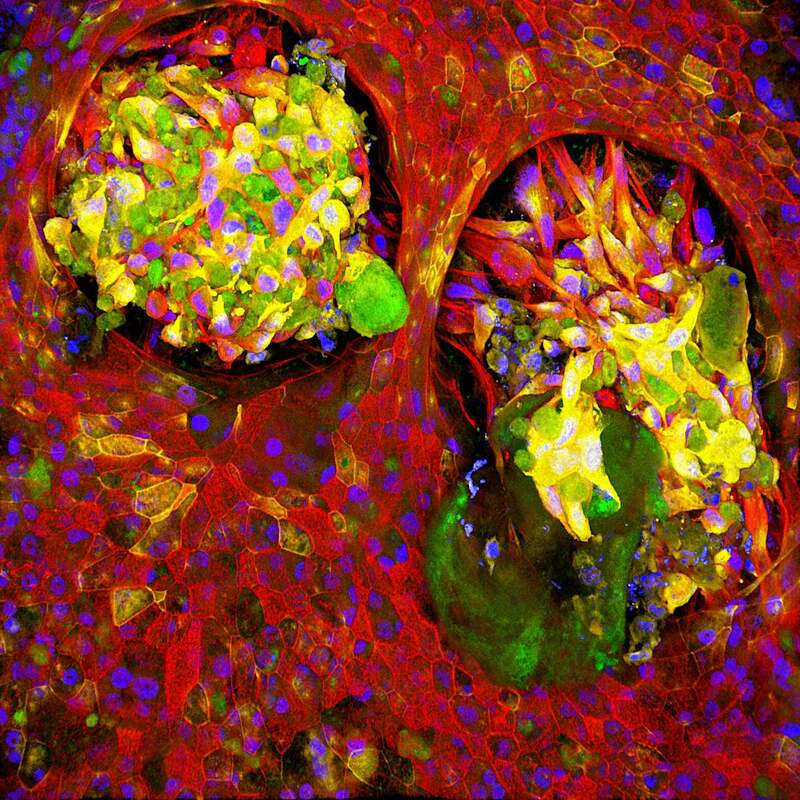 The Wyss Institute has created organ chips that faithfully mimic the lung, kidney, intestine, bone marrow, brain, and more, allowing researchers to grow tumor cells within the natural microenvironments found in the body and then test treatments without exposing animals or patients to potentially harmful conditions. By combining organ chips with bioinformatics and machine-learning approaches, the team hopes to identify new stromal-targeted treatments that can restore inflamed tissue to its healthy form, thereby preventing cancer progression, or induce cancerous or precancerous tissues to revert to a more normal state. By studying human cancer progression in vitro, the team also hopes to discover new diagnostics that can be used to identify the small subset of patients with inflammation-associated premalignant conditions, such as Barrett’s esophagus or ulcerative colitis, that might progress to cancer. Whether targeting blood cells, the immune system, or stromal tissue, all of these projects are guided by the principle of using existing biological elements as the basis for new therapies, rather than trying to invent new cures from scratch. Ashley Nunes, a fellow at Harvard Law School, speaks during The Harvard Global Health Institute conference on AI in health care.